Good Friday to all my friends and family in CBSI! Welcome back to Covers from the Unknown. 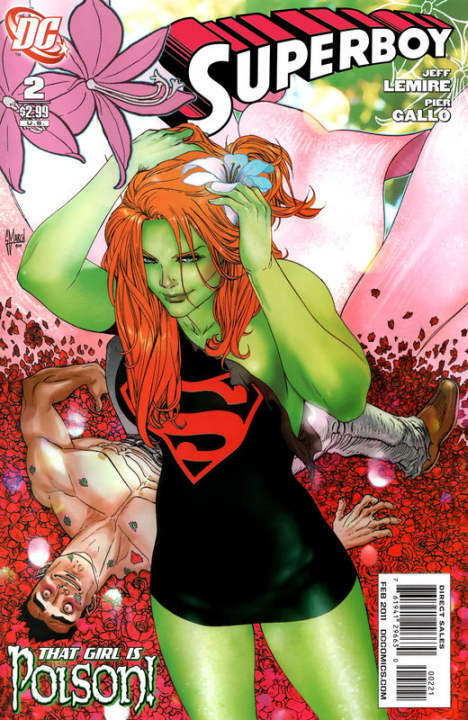 This week I present to you a Poison Ivy variant on the cover of Superboy, from the 2010-11 series. It is a Guillem March 1:10 variant on Superboy #2. I am actually a fan of the Poison Ivy series out now, and when looking for some nice Ivy covers, this was one of her few variants out there. Other than the 3-D covers from a couple years ago, IMHO, this is one of the best. I especially like that she is the star of the cover, and not sharing it with Harley for once! These are very tough to find. According to the print run of 25k for the normal version of the comic, there should be 2,500 of these out there. But I would make a heavy wager that no one collected Superboy at this point. So who knows how many variants there are out there. Looking at the ones sold, they really aren't that expensive, but I am guessing that will change. Good luck to all. Happy Hunting Fellas! Awesome cover Jason! March is so hit or miss (see Powergirl 5) but I really like this one.